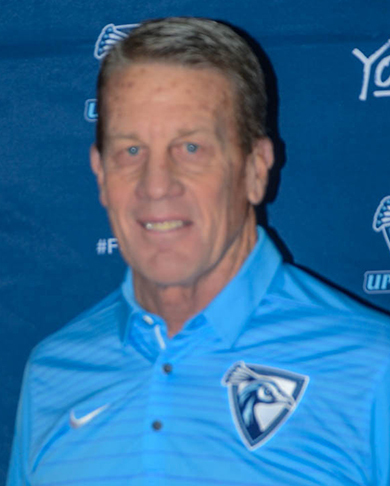 Upper Iowa University announced Rick Hartzell as the University’s new director of athletics today (Thursday, December 7). Hartzell will assume his responsibilities January 3, 2018. Hartzell is no stranger to northeast Iowa; he served as the director of athletics at Northern Iowa from 1999 through 2008. During his time with the Panthers, he oversaw 18 intercollegiate sports, 475 student-athletes, 65 coaches, 7 administrators and 22 support staff. Hartzell initiated the construction plans for the McLeod Center and worked hand-in-hand with the Northern Iowa Development Office to raise all of the required funds to build the facility. Prior to his arrival at Northern Iowa, Hartzell was the director of athletics at both Bucknell University from 1988 through 1999 and the University of Maryland – Baltimore County from 1985 to 1988. In his time in athletic administration, Hartzell developed championship-level athletic programs, found success in fundraising and hired several highly successful head coaches and staff. In addition to his three stints as director of athletics, Hartzell held administrative positions at Northwestern University and University of Iowa and coaching positions at Iowa, Coe College and Northern Iowa. Upper Iowa’s Athletics Department sponsors 16 sports at the NCAA Division II level and as well as varsity cheer and dance. The Northern Sun Intercollegiate Conference is home to 14 of the Peacock programs including baseball, women’s and men’s basketball, women’s cross country, football, women’s and men’s golf, women’s soccer, softball, women’s tennis, women’s indoor and outdoor track and field, volleyball and wrestling. UIU’s men’s soccer team competes in the Mid-America Intercollegiate Athletic Association and the women’s lacrosse team, which begins competition in the spring of 2019, will battle in the Great Lakes Intercollegiate Athletic Conference.